Dayton, Nevada- Come on down to the Dayton Community Center tonight, Wed Feb 18th, 2015 – there are lots of exciting things going on. There will be a presentation about the new Community Supported Agriculture (CSA) Basket Club during Healthy Communities Coalition’s free weight loss support group, followed by a Zumba Gold class ($5). Wendy Madson of HCC’s Community Roots nursery will explain how the fresh food basket program works. Come and see the local produce you can purchase monthly that will help growers grow and give your family more access to healthy foods. Wendy’s presentation starts at 5:30 pm. Immediately following at 6 pm, there’s an option to take a Zumba Gold class for just $5. 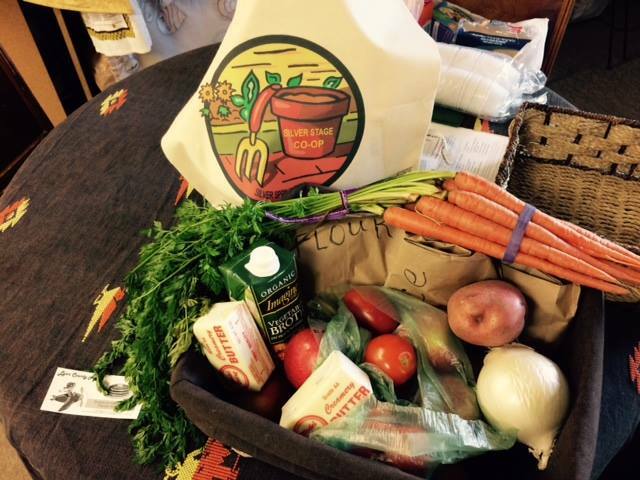 Pre-ordered CSA Baskets can be picked up at the Silver Stage Co-Op in Silver Springs or in Dayton. Call Wendy for more details: 250-7884. The CSA Basket Program: Each month, customers can pre-order beautiful baskets full of fresh, organic and naturally grown herbs and produce and natural products. Baskets also contain recipe ideas. This is a “Community Supported Agriculture” Club serving the Lyon region and strengthening the local economy by increasing opportunities to buy local. Baskets must be pre-ordered, and can be purchased with cash, checks, credit cards or SNAP/EBT. The free weight loss support group, which meets every Wednesday, is one part of the region’s developing “Health Hub.” For more information, contact Lisa Selmi at Healthy Communities at 246-7550. ← Healthy Communities Coalition is Hiring!